Beaten All-Ireland finalists Tyrone will be without star forward Mark Bradley for the upcoming 2019 season. The Killyclogher man is studying for a teaching qualification in Liverpool, The Irish News has reported. Bradley suffered an ankle injury in Tyrone's Ulster Championship loss to Monaghan but returned to fitness to start the final against Dublin. Goalkeeper Michael O'Neill is also said to have opted out of the Red Hands' panel. 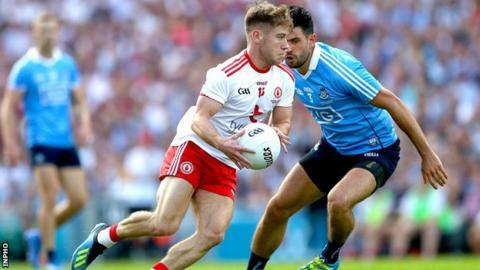 Bradley was primed to be one of the stars of Tyrone's summer until an ankle injury forced him off in the Ulster championship defeat by Monaghan in May. He battled his way back to fitness and won his place in the first fifteen for the Super 8s tussle with Donegal after hitting a combined total of 1-3 against Cork, Roscommon and Dublin. According to the newspaper, Tyrone boss Mickey Harte has recalled trio Conan Grugan, Darren McCurry and Kyle Coney for the upcoming Dr McKenna Cup. Following their disappointing quarter-final exit in the provincial championship, the Red Hands needed a last-gasp point from Cathal McShane to force their first round qualifier against Meath into extra-time. However, having come through that test, they soon began to gain momentum, defeating Donegal and Roscommon in the inaugural Super 8s before avenging their Ulster Championship defeat against Monaghan in the semi-final.